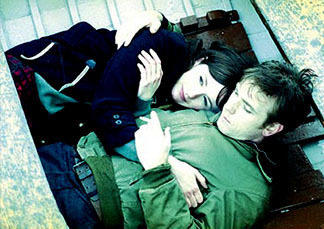 David Mackenzie's adaptation of this Alexander Trocchi novel fragments a year in the life of Joe (Ewan McGregor), a failing writer supported by Cathie (a scene-stealing Emily Mortimer) in 1960s Scotland. His journey begins when he runs away from Cathie, throwing his typewriter into the river and joining a small barge that operates through the canals between Edinburgh and Glasgow. Before long both Joe and the elder boat operator Les (a solid The Magdelene Sisters' director Peter Mullan) come across a dead Cathie in the water and soon Joe's past returns to reveal his role in her death, all while the papers pick up a false lead and the courts charge her plumber, a suspected lover, with the murder. In the meantime, Joe breaks up the barge's family by consummating an affair with Ella (Tilda Swinton), the much younger wife of the functional yet gambling Les, then gets nasty with her recently gratefully widowed sister and finally runs away to a boarding house where he shags his boarder's wife. Eventually Joe, Les and Ella are brought together as witnesses in the crowd at the trial for Cathie's plumber lover and a tortured Joe's best effort at resolving his inner demons is to admit his presence at her accidental death by way of an unsigned letter.